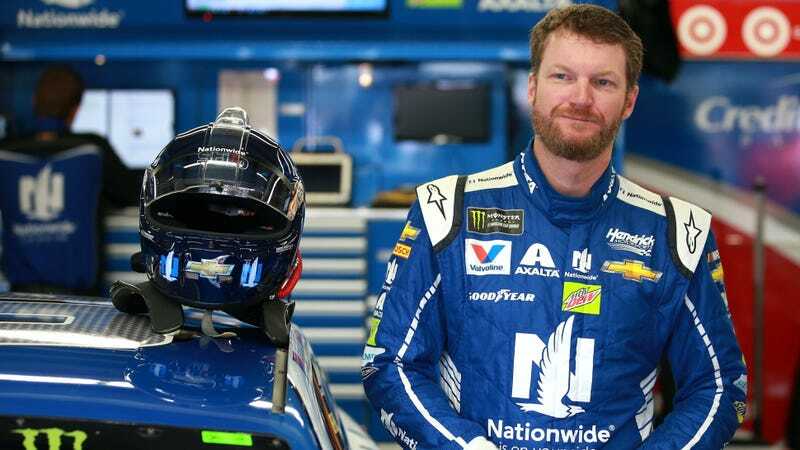 NASCAR’s most popular driver for 14 straight years and soon-to-be retiree Dale Earnhardt Jr. signed onto a multi-year deal to join NBC Sports’ NASCAR commentary team in 2018, the network announced today. Look, we all knew this was going to happen. The people need—no, demand!—more Earnhardt. Fans aren’t content to see him retire out of the public eye. Why on earth do you think we’re getting a DIY Network renovation show with the Earnhardts? We’ve become too used to that friendly, down-home voice telling it like it is to fans. Personally, I will eat up every second of anything they touch. As a walking, talking, and occasionally hooning wealth of NASCAR knowledge, not putting Earnhardt in the commentary booth would be a tremendous mistake. The only real question was which network was going to stick him in the booth. Fox, which carries the first half of the NASCAR season, signed beloved recent retiree Jeff Gordon for their commentary booth, so NBC seemed like an inevitability for the next NASCAR superstar to call it quits. Earnhardt joins NBC’s commentary team of Steve Letarte, Jeff Burton, Dale Jarrett and Kyle Petty on NASCAR broadcasts. Some of Earnhardt’s own media-related entities, such as Hammerhead Entertainment and Dirty Mo Media, are also partnering with NBC. More amusingly, though, NBC says that Dale Jr.—who signed with NBC Universal, not just NBC Sports—will have opportunities to make appearances across the NBC network, not just on NASCAR broadcasts. I, for one, would be all about curling if Earnhardt was the running commentary. Please, NBC, make that happen.